The Tragedy of the Commons is one of system archetypes. It is an economic theory describing a system with shared resource where the actors act independently according to their self-interest. Draining of the resource can cause their actions to behave contrary to the common good. The Tragedy of the Commons became well known after an article by ecologist Garrett Hardin was published in 1968. System Archetypes describe common patterns of behavior that we can find in complex systems. They are part of a larger topic of System Dynamics. The Tragedy of the Commons provides unique insights into the effect that an un-systemic approach to organizational structure can have on overall, long-term performance. The commons is something or someone that presents a common resource. It can be various natural resources. In an organization, it can be people, material, space, tools, etc. It can be anything, that is simultaneously made available to multiple people (or teams in organization). Each person or team claims their share of the commons within the context of the goals and objectives that they have set for themselves. They regard the commons as being uniquely available for their own purposes. Although their lack of awareness of the demands others place on the commons are not the result of thoughtless disregard, the effect on the commons is the same. As each person or team increases their demands and expectations of the commons in the name of their own goals, the commons gets under steadily increasing pressure to perform. In the case of commons such as materials or space, there is no conscious awareness of increased demand, but the concrete, physical limitations have no elasticity, and the satisfaction of people or teams placing demands on the commons erodes. Individual or team performance declines as the erosion of the commons affects their ability to meet individual goals and objectives. Aggregate organizational performance erodes as the interaction and interdependency of multiple individual and/or team performance begins to reflect the declining performance of the individuals or teams. Organizational goals themselves begin to erode and to reflect the diminished ability of the commons to support the goals and objectives of the individuals and teams that depend on the commons. The commons itself deteriorates as a valued and valuable resource to the point where it is regarded as a cause of failure rather than success. There are two large areas where The Tragedy of the Commons can be applied. One of them is environment (and common land). In this case, the commons is any shared or unregulated resource, for example atmosphere, oceans, rivers, fish stocks, etc. The other case is the application of The Tragedy of the Commons in an organization and its environment. The System Archetypes are highly effective tools for gaining insight into patterns of behavior, themselves reflective of the underlying structure of the system being studied. The archetypes can be applied in two ways - diagnostically and prospectively. Diagnostically, archetypes help managers recognize patterns of behavior that are already present in their organizations. Archetypes are also useful prospectively for planning. As managers formulate the means by which they expect to accomplish their organizational ends, the archetypes can be applied to test whether policies and structures under consideration may be altering the organizational structure in such manner as to produce the archetypal behavior. If managers find this to be the case, they can take remedial action before the changes are adopted and embedded in the organization’s structure. 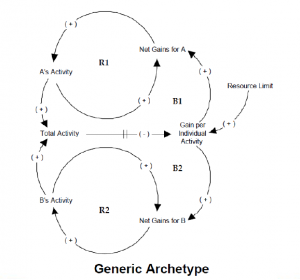 The archetype can be used to help connect the long-term effects of individual actions to the collective outcome, and develop measures for managing the common resource more effectively. Establish methods for making the cumulative effects of using the common resource more real and immediate to the individual players. Re-evaluate the nature of the commons to determine if there are ways to replace or renew (or substitute) the resource before it becomes depleted. Create a final arbiter who manages the use of the common resource from a whole-system level. Identify the “commons”. What is the common resource that is being shared? 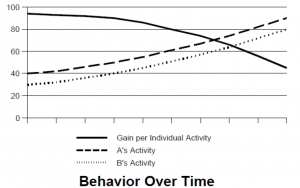 Determine incentives. What are the reinforcing processes that are driving individual use of the resource? Determine the time frame for reaping benefits. Determine the time frame for experiencing cumulative effects of the collective action. Make the long-term effects more present. How can the long-term loss or degradation of the commons be more real and present to the individual users? Reevaluate the nature of the commons. Are there other resources or alternatives that can be used to remove the constraint upon the commons? Limit access to resources. Determine a central focal point - a shared vision, measurement system, or final arbiter - that allocates resources based on the needs of the whole system. In many respects the Tragedy of the Commons is a classic example of reductionistic thinking. 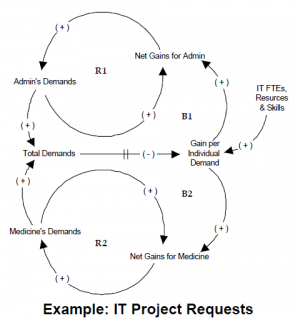 There are two parties that place demands to the IT department – Admin and Medicine. 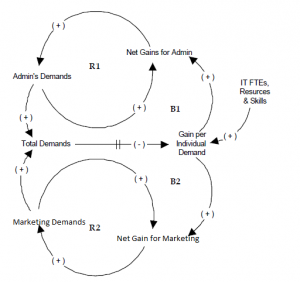 As net gains for Admin or Medicine grow, their demands for IT grow and the total number of demands to IT grows. As the total number of demands to IT exceeds the capacity of the IT department, its efficiency falls. Total demands either need to be reduced or IT resources raised. Either way, some kind of coordination and agreement needs to take place. Now the exercise will be similar to the example above. You are an Admin in a company and you place demands to the company’s IT department. As your productivity rises, your demands for IT rise as well. There is marketing department in the company that places demands to IT as well. Create the Casual Loop Diagram for the example. There was a change in the company and the IT department now takes demands from Management as well. 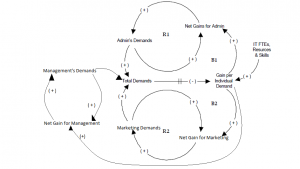 Create the Casual Loop Diagram for the modified case as well. This page was last edited on 21 January 2017, at 02:12.